along with creamy slaw and Thai sweet chili and Sriracha mix sauce ! Taco Tuesdays are getting better! Taco Tuesdays are fun right! Specially when you are HUGE Taco fan and want to get a great flavor change every time you want to make a Taco at home. 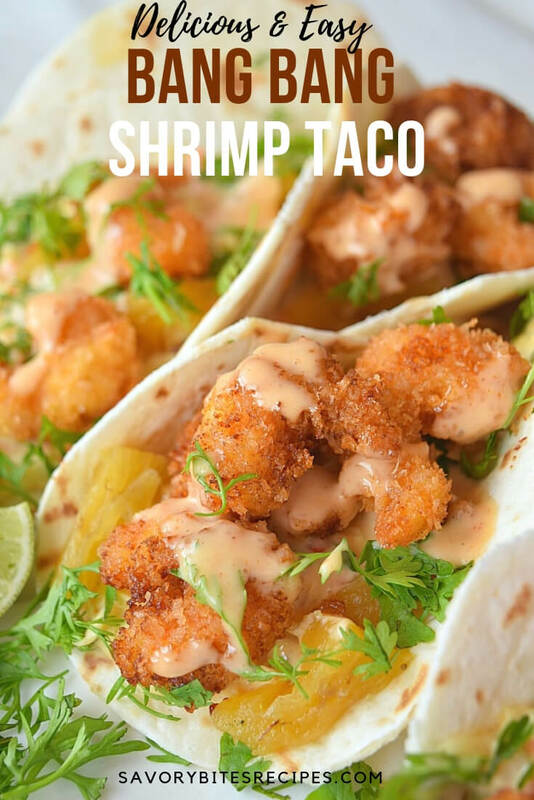 I love Mexican food,specially because one can do so many things with one basic recipe, so many variations / changes are possible to make amazing Taco/Tortilla wrap/Burrito/Quesadilla/Taquitos....list is endless! I recently made these Chicken and Cream Cheese Taquitos,they turned out to be soooo amazingly good. Do check that recipe and try it.You are gonna love it for sure. Many more recipes to follow but coming back to this Taco. 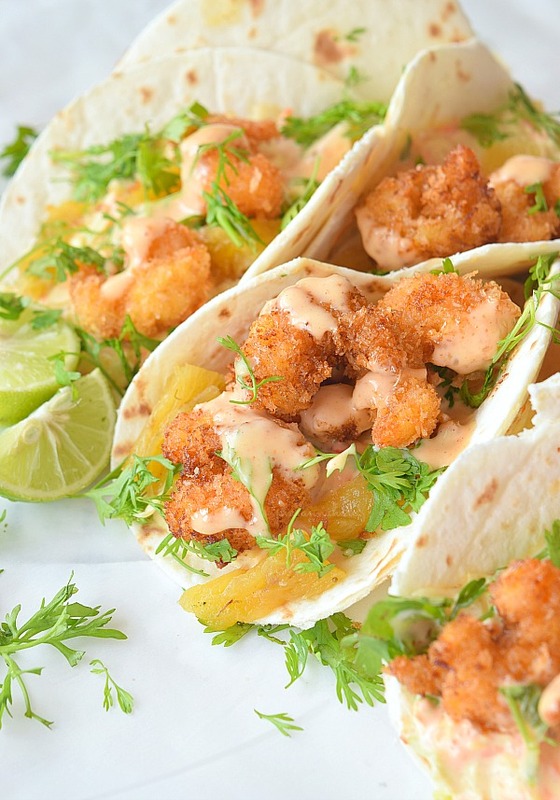 Bang Bang shrimp is amazingly crispy,flavorful and yummy! Sauce that they are coated with is made of Thai Sweet Chili Sauce and Sriracha,yumm! I made slaw at home to go with these Taco, the slaw is very basic and simple yet very flavorful.It even reminds of KFC slaw sometimes. One more addition I did to these amazing Taco is Pickled Pineapple pieces- yes I have shared this recipe of Pickled Pineapple before. Have you tried that? It even tastes awesome just to have like a snack. Easy lunch or dinner is a relief for all.I have shared many of my easy lunch /dinner recipes recently. I will share a few here so that It will easy out for you all to check: Fettuccine Alfredo, Shrimp Scampi, Spaghetti Aglio e Olio. 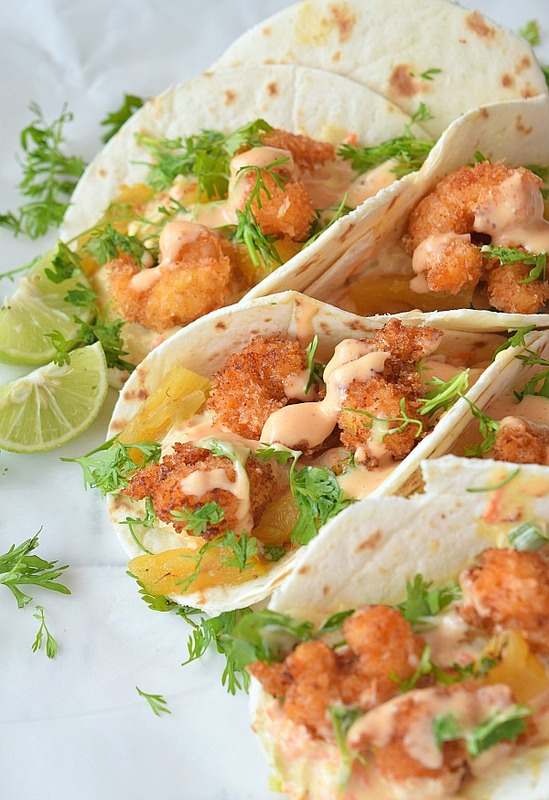 These recipes will fix your food cravings in just few minutes. Firstly marinate the shrimp in buttermilk,salt,flour,cornstarch,egg,cayenne pepper and black pepper. Keep this aside for 10 mins. Dredge them with Panko or any breadcrumbs of your choice. Heat oil and fry them till golden brown. For slaw: mix together all shredded/grated veggies of your choice,I used cabbage,carrot spring onion. Add salt and sugar along with honey mustard,lime juice,mayonnaise and cream and you are done! 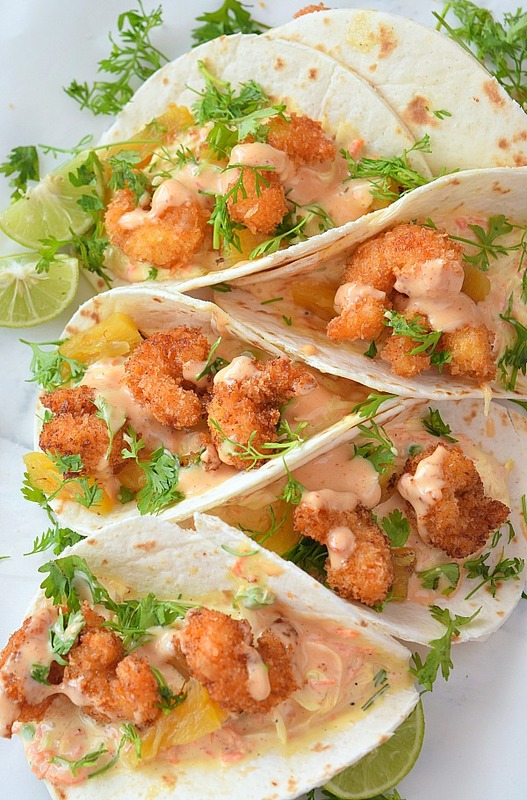 Very flavorful and restaurant style,Bang Bang Shrimp in a Taco,with easy homemade slaw and Thai sweet Chili and Sriracha Sauce,wrapped in a soft flour tortilla ready to be devoured to the last bit! 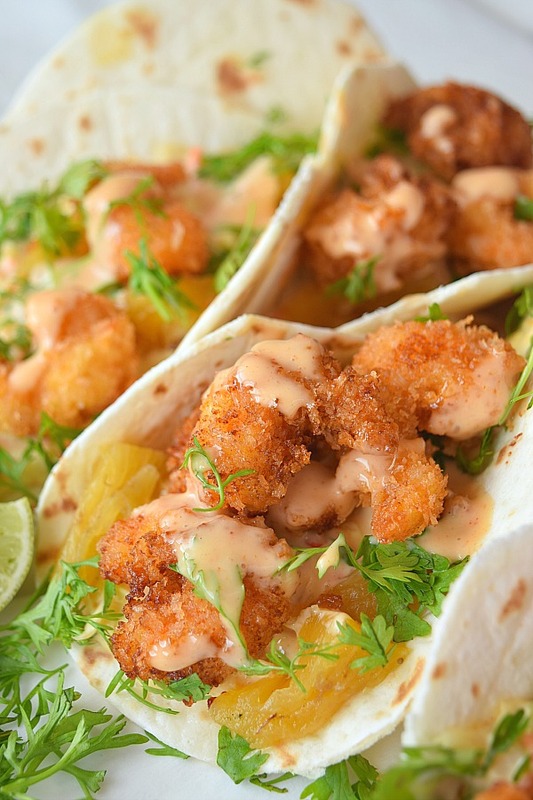 In a bowl,add the ingredients except the shrimp to make crispy shrimp and mix well. Add the shrimp and optionally you can leave it aside for 10 mins to marinate. 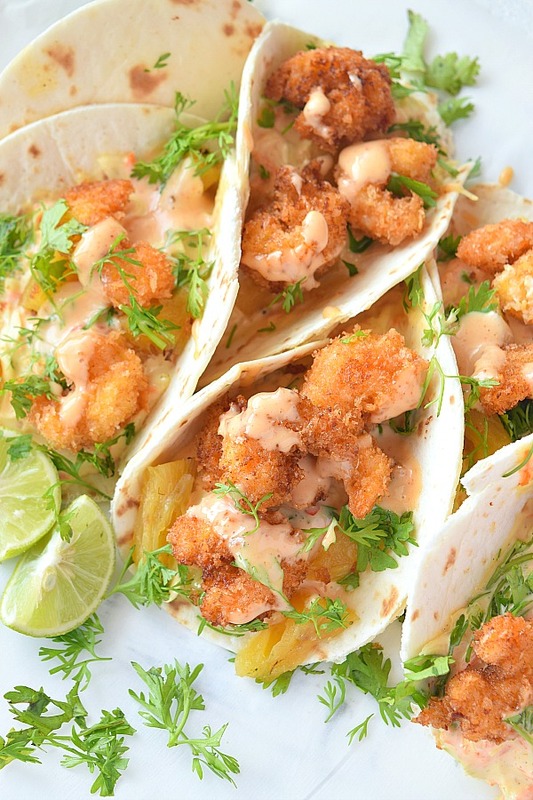 Heat oil in a pan, once hot enough,coat all the shrimp with Panko and fry till golden brown. Drain on a kitchen tissue and keep aside. To make the Sauce: In a mixing bowl,add the ingredients for the sauce,mix and keep aside. To make Slaw: Mix all the ingredients mentioned and mix well,keep aside. 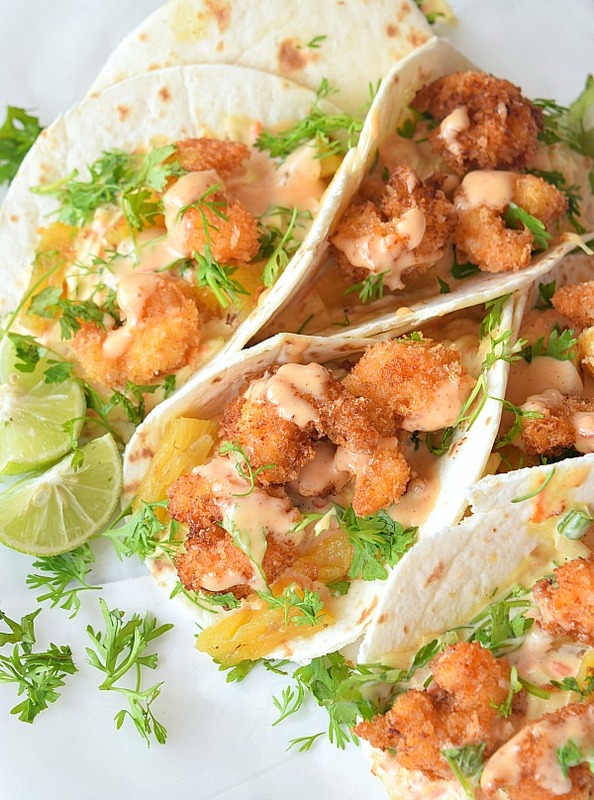 Place the tortilla,add the slaw,shrimp,sauce,chopped cilantro and a squeeze of lime,pieces of Pickled Pineapple. 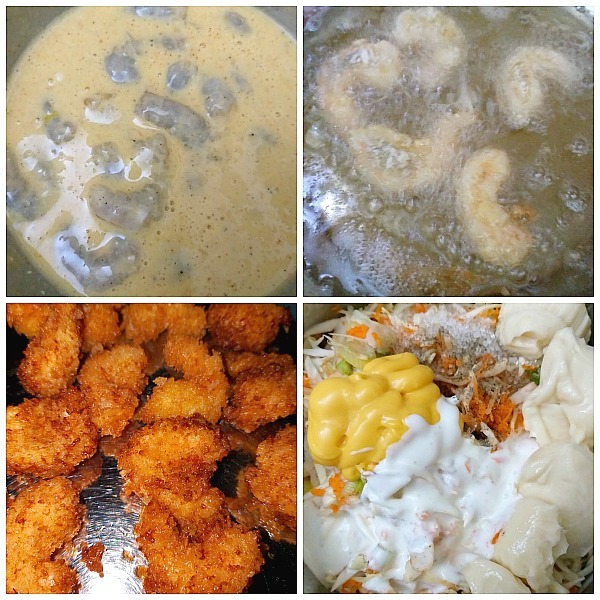 Hello Prasanna, what a fantastic recipe, mouthwatering pictures and just love your new blog look. Must say looks classy & super awesome :) Keep up the wonderful work. - Meghna.